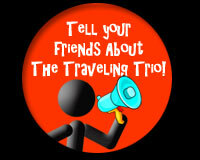 The Traveling Trio is an adventure-filled educational series hosted by three siblings; twelve-year old Olivia and her ten-year old twin brothers, Ingram and Everett. The children present the geography, history, language and culture of exciting destinations as they visit both famous landmarks and off-thebeaten-path attractions. The series is designed for children (age 8-12) who are open to learning about the world. This includes children who enjoy learning about nature, animals, science, art, history and geography. These kids are looking to learn while being entertained. The new high-definition half-hour episodes are available on DVD and on TV in countries all around the world..
Big Red Hat Productions is a family endeavor. We, the parents of Olivia, Ingram and Everett, have spent the last twelve years creating and seeking out activities, educational materials and real-world experiences that we feel are creative, fun, challenging and inspiring. Traveling is one of those experiences. By seeing how other people live, children build character. They learn that the way they live is not the only way to live. This can help provide children with a sense of appreciation of other cultures and their own. It can teach humility, empathy and respect. Olivia, Ingram and Everett are like many other children in this world. They are eager to learn and even more eager to share what they’ve learned. They are innocent, energetic and good-hearted and they would love to connect with the thousands of other kids around the planet who are just like them…real kids looking for real fun! An acceptance of history as a “cool tool” for understanding who we are today, how world history effects us, and where our society is headed. A realization that learning and using a foreign language is not a bad thing and is an obtainable goal. An understanding that all people have the same basic needs and an appreciation for the variety of ways those needs are met. An awareness of the interdependence of man and nations that fosters a desire for cooperation and peace. An understanding of the interdependence of man and nature, with a feeling of responsibility toward an ecological whole. It is our mission to teach children (and their parents) that there is tremendous value in engaging the world beyond the confines of their own familiar surroundings. This mindset can act as a catalyst for personal growth as well as cultural awareness and empathy on a global scale.